This powder-coated steel outdoor message board matches perfectly with many of our other powder-coated steel products such as picnic tables, park benches, trash cans, and exercise equipment machines. Use this message sign to post general information for park visitors, facility rules and regulations or safety and usage instructions for the fitness equipment. This is the standard message sign size. 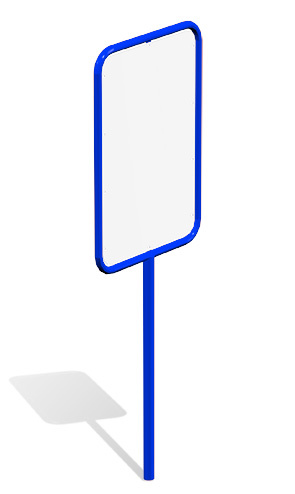 Matching message signs are also available with a smaller panel board or with dual panel message boards that sit at a lower height. Both options are shown below in the Matching Products section and can all be powder-coated in any of the color options shown below. The sign itself is white. Ships fully assembled.